The Saab Aero X concept harnesses the power of Saab’s aviation and Scandinavian roots to make a unique statement in performance car design. Conceived as a study to explore future design directions, its innovative features preview the development of an enhanced design language that will inspire future Saab products. 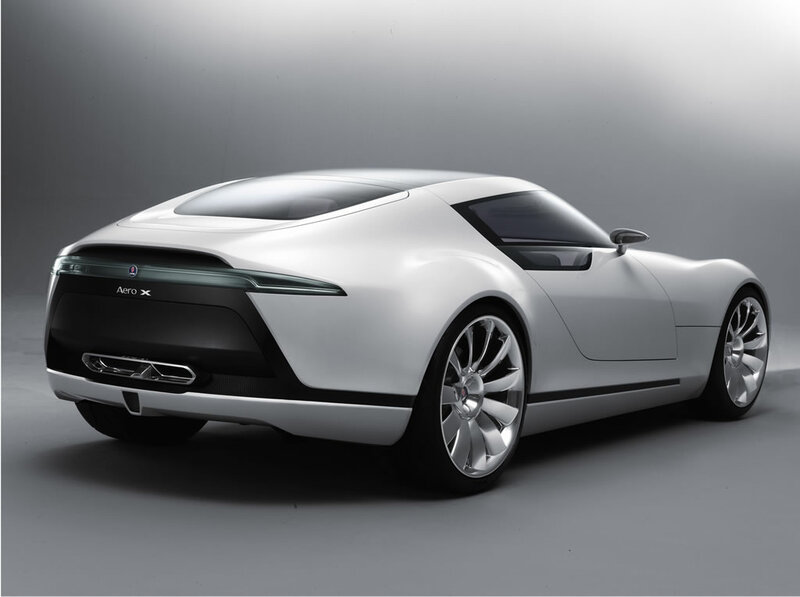 As you would expect from Saab, this dynamic two-seater sports coupé breaks with automotive design convention both outside and inside. First, there are no doors…or windshield pillars. That’s because the Saab Aero X adopts a cockpit canopy, just as you would see on a jet aircraft. It offers the Aero X pilot full 180 degree vision, and also facilitates entry and exit from its low-slung cabin. Thrust for the all-wheel-drive Saab Aero X also comes from a powerplant with a difference. The 400 bhp, twin-turbo, BioPower V6 engine is fueled entirely by bioethanol, a sustainable energy source that is kinder to the environment by cutting fossil CO2 emissions. The ‘green power’ of this advanced engine gives new meaning to the phrase ‘performance with responsibility’. Inside, the Saab Aero X’s cockpit also adds a new dimension to clean Scandinavian interior design by completely eliminating conventional dials and buttons. 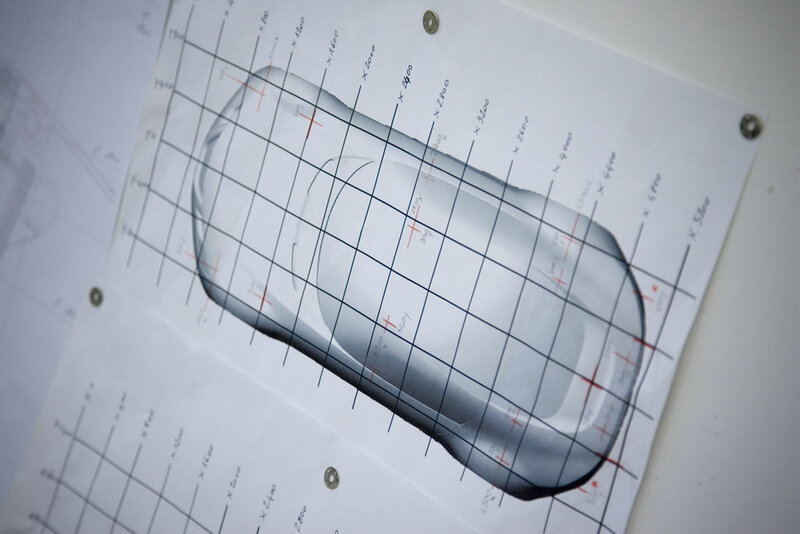 Instead, Saab has applied techniques derived from Swedish glass and precision instrument making, displaying data on glass-like acrylic ‘clear zones’ in graphic 3-D images. 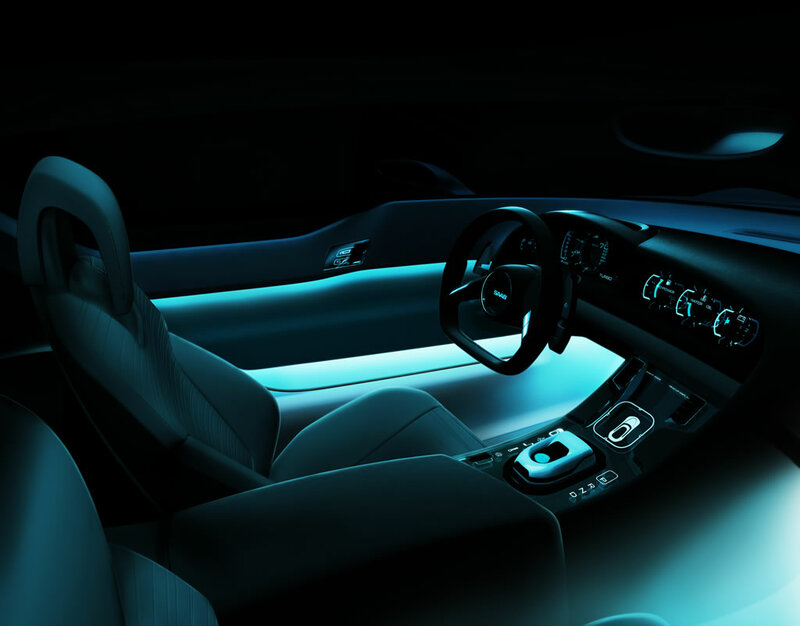 All exterior and interior lighting is by LED (light-emitting diode), which has given the design team new freedoms to exploit the compact packaging benefits of a technology that will be featured increasingly in future Saab products. With weight-saving carbon fiber bodywork, a lightweight powertrain, electronically-controlled suspension and all-wheel drive, the Saab Aero X is an exciting driver’s car that promises a level of performance to match its looks. Computer simulations anticipate zero to 100 kph in just 4.9 seconds and a top speed of 250 kph (limited). 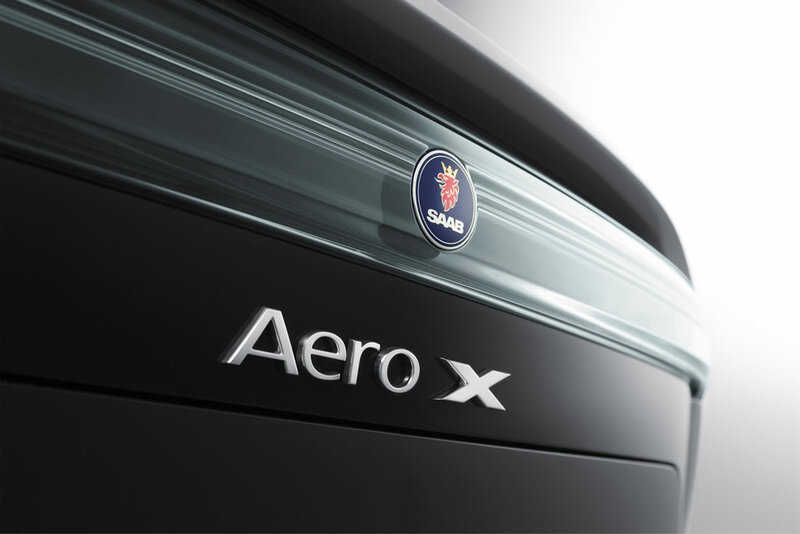 Despite being so tightly driver focused, the Aero X still offers surprising practicality, again, a quality you would expect to find in all Saab designs. That dramatically sculpted tail conceals a useful twin storage facility, with a conventional hatch opening and sliding drawer underneath. 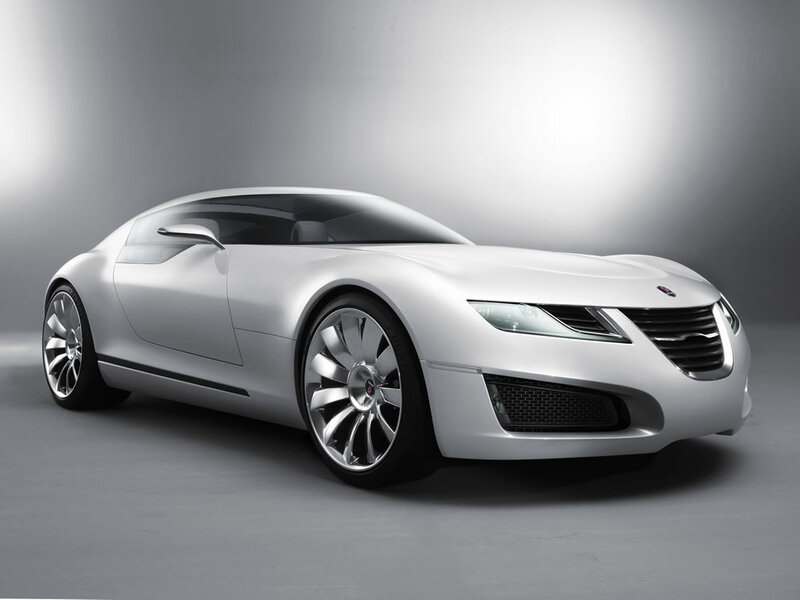 The Saab Aero X is the latest in series of concepts from Saab, each accentuating different brand qualities. These include the ‘four-dimensional’ 9X (IAA Frankfurt 2001), the 9-3X Cross-over Coupé (Detroit 2002) and the 9-3 Sport Hatch (IAA Frankfurt 2003). The Saab Aero X concept is a dynamic, two-seater sports coupé that showcases two core brand elements: Saab’s aviation heritage and its Scandinavian roots. Here designers Anthony Lo, Alex Daniel and Erik Rokke, who conceived this study at design operations in Sweden, explain its significance. The muscular shape of the Saab Aero X clearly signals its role as a high performance driver’s car, while its looks and visual appeal show this is a design that could only come from Saab. With innovative features typical of the brand and thrust from a 400 bhp, twin-turbo BioPower engine, it opens up new horizons for Saab’s development. “This car has given us the opportunity to push out the boundaries of Saab design, to explore new directions without any constraint,” explains Anthony Lo, GME’s Director of Advanced Design. 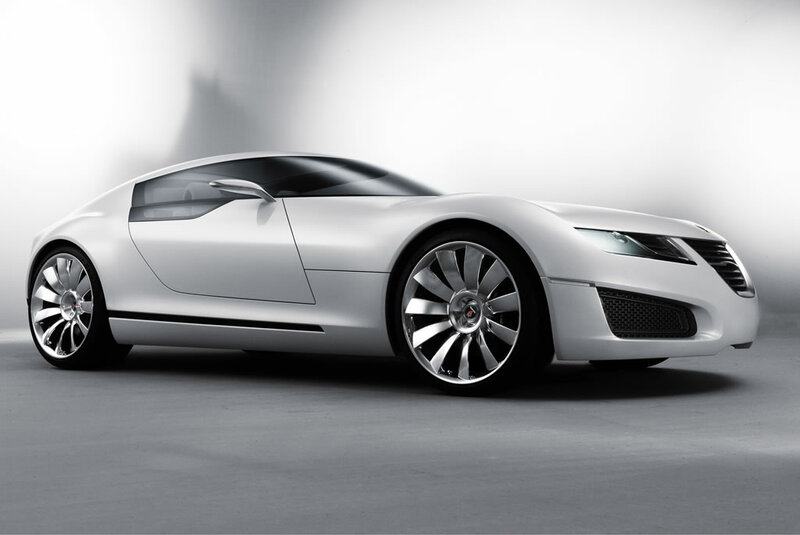 “It represents our vision of what a high performance car from Saab could look like. 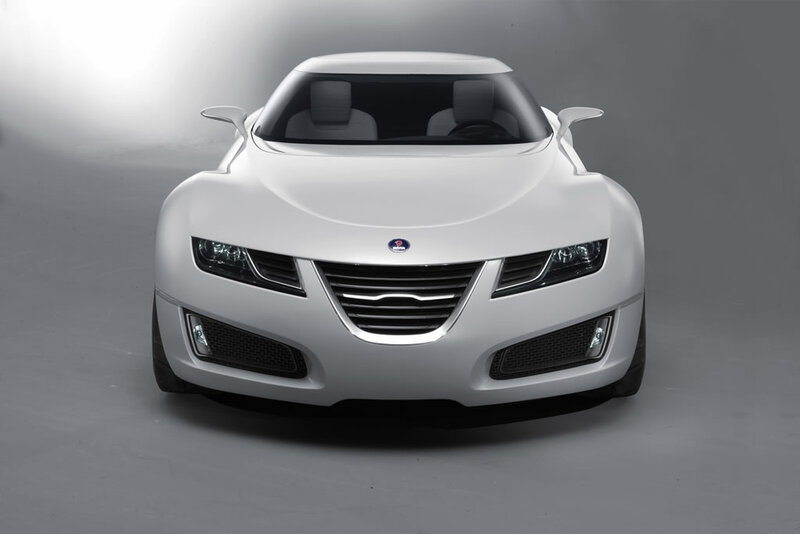 In making such a strong statement, it is probably the most self-expressive, emotional design Saab has ever produced. The car’s most striking visual feature – the front-opening glass canopy – combines two themes, aviation and Saab design tradition. While parallels with jet aircraft are obvious, the canopy also ‘stretches’ a more conventional Saab signature, the wrap-around windshield. The first Saab 99/900 models introduced this feature, bending the glass screen round at its front corners to meet the A-pillars. The ‘cockpit’ look is now taken to its extreme on the Aero X, with the A-pillars eliminated altogether. By contrasting dark, tinted glazing with the pearlescent white of the show car’s bodywork, the extended wrap-around screen is emphasized even further. The role of this feature as a key Saab ‘identifier’ is also underlined by the familiar curvature of the top of the screen, where it meets roof section, which echoes the ‘peaked cap’ look of previous Saabs. The purity of the exterior design is reflected by the clean surfaces, notable for an absence of ‘furniture’ such as door handles, rubbing strips or even spoilers. “To maintain the analogy of an aircraft fuselage, the lines had to be kept stretched and smooth flowing, without attracting the eye to any particular point,” adds Daniel. “We wanted to represent the brand’s aviation roots in an intelligent way, without using showy gimmicks, which would not be the Saab way.” The aircraft references are there, of course, but presented in a subtle fashion: the deep, front air intake ducts, the ‘turbofan’ design of the alloy wheels and the further evolution of the front grille with its aircraft-like central motif. An innovative use of glass with illumination by LED (light emitting diode) is a recurring theme, both outside and inside the Aero X. “Apart from visualizing the brand’s links with aviation, this is the other main theme of the car,” explains Erik Rokke, principle designer of the interior. “The glass industry and the manufacturing of precision instruments is very strong in southern Sweden where we are based. We have seen how glass surfaces are treated to give various optical effects, how light is used with glass and how instrument displays possess a very clear, precise imagery. It was very natural for us to use this as an inspiration on the Aero X,” adds Rokke. Inside, the Aero X continues a Saab tradition in refining the man/machine interface to clearly and safely present driver information. In a development of the Night Panel feature on current Saab cars, the entire front fascia and central console display is now a clear zone with layered, acrylic surfaces used to display selected information. Techniques in sandblasting, polishing and laser-etching from the Swedish glass industry are combined with subtle LED back and side lighting to produce striking ‘3-D’ imagery. Green illumination, another Saab tradition based on aviation practice, is retained for optimum clarity. 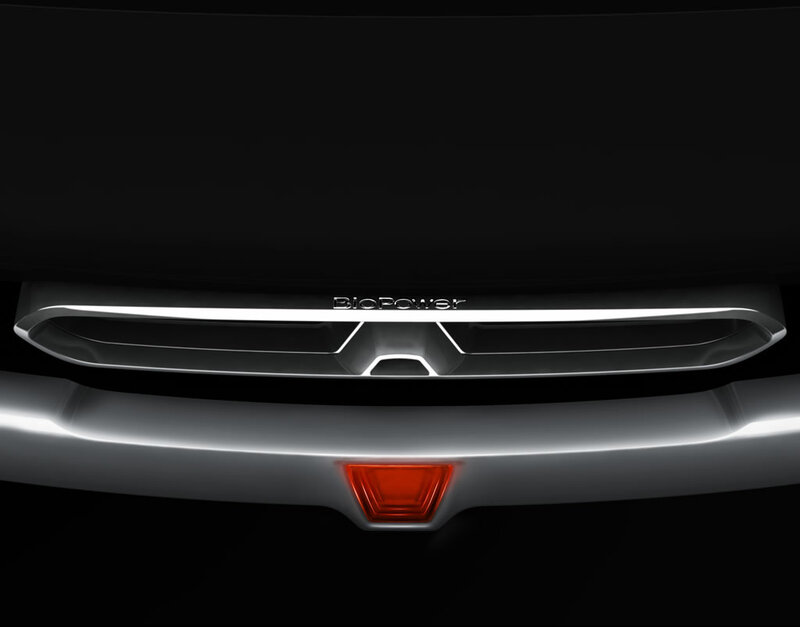 The design team has also fully exploited the advantages of LEDs – compactness, long life and fast response – in both the front and rear light detailing. The headlamps incorporate single LEDs for full and dipped beam, previewing a development likely on production cars of the near future. These are located behind projector lenses, the details of which are highlighted in daytime running by green downlighting from small LEDs mounted in the top of the headlamp unit. At the rear, there are no obvious tail-lights at all. 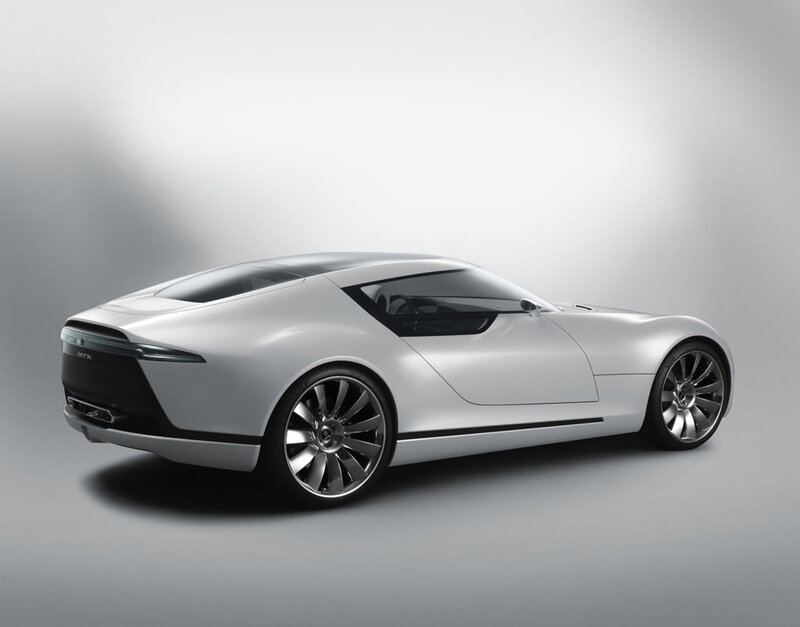 Here, a slim, opaque white bar, resembling the body color, runs across the back of the car. It accommodates LEDs for all rear light functions and when a bulb illuminates its glow is diffused, disguising the pinpoint light source. In character and performance, the Aero X is the most driver-focused design yet to come from Saab and Anthony Lo views it an important step in helping to define future products for the brand. “The future is about looking back, as well as forward, so we can interpret the special qualities that go to make up what a brand stands for,” says Lo. “However, in giving products a clear identity, we should not feel restricted by previous design conventions and the Aero X explores new ways of expressing what Saab stands for. “In showing how a focused, high performance sports car from Saab could look, we have been able to introduce a more self-expressive, more assertive design language, tipping the balance away from understatement. In exterior design, the Aero X fulfils its mission as the first car from Saab to focus on communicating the brand’s unique aviation heritage. And, as you would expect from Saab, it does so in an intelligent, typically ‘Saabish’ manner. In concept, the entire form of the Saab Aero X’s curvaceous, low-slung bodywork is a dramatic evocation of the Svenska Aeroplan AB’s roots in aircraft design. Its innovative cockpit canopy and aviation motifs at the front and rear are designed to come together as a metaphor for the fuselage of a jet. It is, in essence, an ‘aircraft for the road’…and jets don’t have doors! Stretching the design envelope opens up the prospect of full 180-degree vision for the occupants of the Aero X, as well as better access to its low-slung cabin. In doing so, the car presents aircraft-inspired solutions that question conventional design orthodoxy. The tautly drawn shape of the Aero X gives it the appearance of being poised ready for take-off. 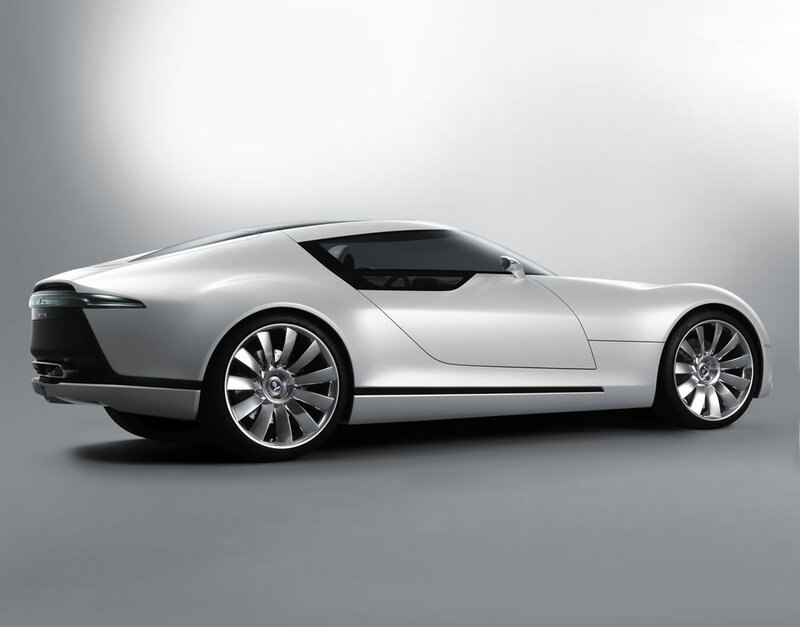 With a roof height of just 1276 mm (50 inches), the coupe’s cabin sits exceptionally low to the ground. The flowing contours of the carbon fiber bodywork around the long hood and steeply raked rear pillars are interrupted only by muscular blisters to accommodate massive ‘turbofan’ wheels (22 inch front/ 23 inch rear). Short front and rear overhangs combine to give the coupé a body language and attitude that promise exceptional performance. An exterior tour would normally start at the front of the car or, in the case of the Aero X, the nose of its ‘fuselage’, but that would ignore its most innovative and striking feature, the cockpit ‘canopy’. To gain entry, the Saab Aero X pilot and passenger do not use doors. Instead, the car’s canopy swings open, just as you would see on a jet aircraft. This assembly comprises three sections: the panoramic glass roof and wraparound windshield, the side windows and side body panels, and the top section of the interior fascia. Operated from the outside by remote control, the canopy’s movement is pivoted from the front and choreographed to simultaneously move upwards and forwards, revealing the two-seater cabin underneath. The sense of theater this brings to the Aero X is underpinned by practical driver benefits. The canopy’s wrap-around screen allows Saab to completely eliminate the A-pillars, opening up an uninterrupted field of vision for the driver through 180 degrees, or as far the head can turn. This makes a significant contribution to real-life safety, allowing the driver to see more clearly, particularly in moving traffic conditions when the presence of the A-pillar can be obtrusive. In combination with the panoramic glass roof above, the occupants of the Aero X enjoy unrivalled visibility and the illusion of sitting in an open car. Another practical benefit of this design is more convenient entry and exit because there is no low roof to duck under. It is also easier for the driver or passenger to step across the car’s substantial chassis sill, which is deep and wide for structural stiffness. As a further benefit, the Aero X can be parked in relatively tight spaces. There no need to allow room for opening the doors, which are traditionally very wide in this type of car to make entry and exit easier. The frame of the canopy assembly and the two connected side panels are made from carbon fiber for high strength and lightness. The complete canopy movement – on opening, the side panels are first pushed out, then pulled back in alongside the rising windshield/side window/ roof section – is achieved by using articulated hinge mechanisms. 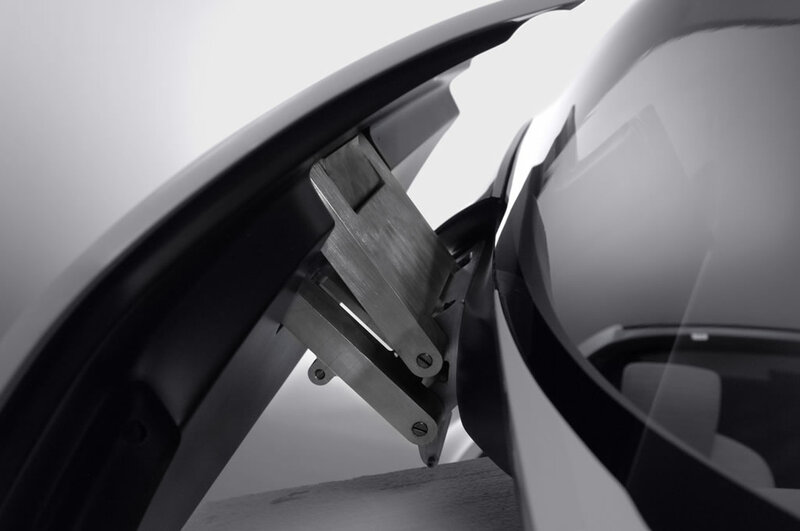 The vertical clearance required for opening the canopy has been minimized to just 1.8 meters and a series of anti-pinch sensors ensure the closing operation stops automatically in an emergency. The canopy is tightly located in seating channels along the cabin sides, ensuring there is a completely weatherproof seal. The nose of the Aero X is also focused on reinforcing the jet aircraft metaphor. Apart from the central grille, two deep and wide air ducts are the most graphic feature. These are intended to symbolize the prominent air intakes for the engines of a jet. However, as this is a Saab design, their purpose is more than cosmetic and they are designed to feed air to the turbo intercoolers either side of the Aero X’s V6 powerplant. LED driving lights are also neatly located in the outboard, forward facing edge of each duct. 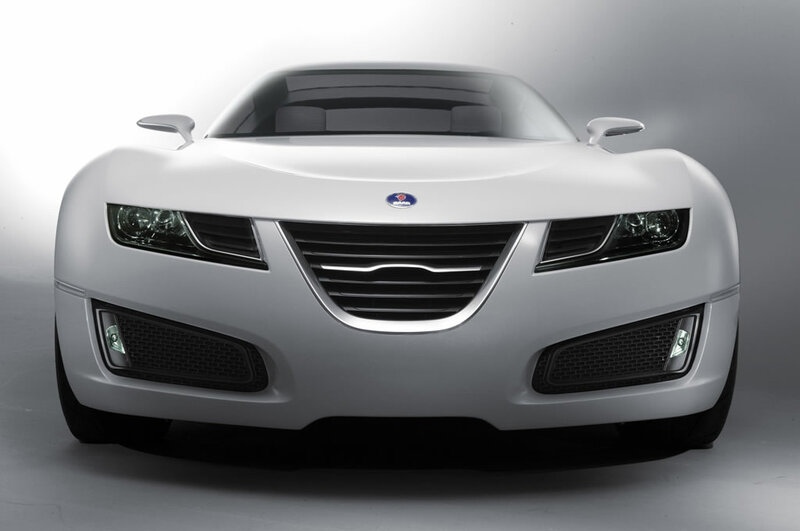 The grille treatment is a further evolution of the traditional three-port ‘face’ of Saab cars. 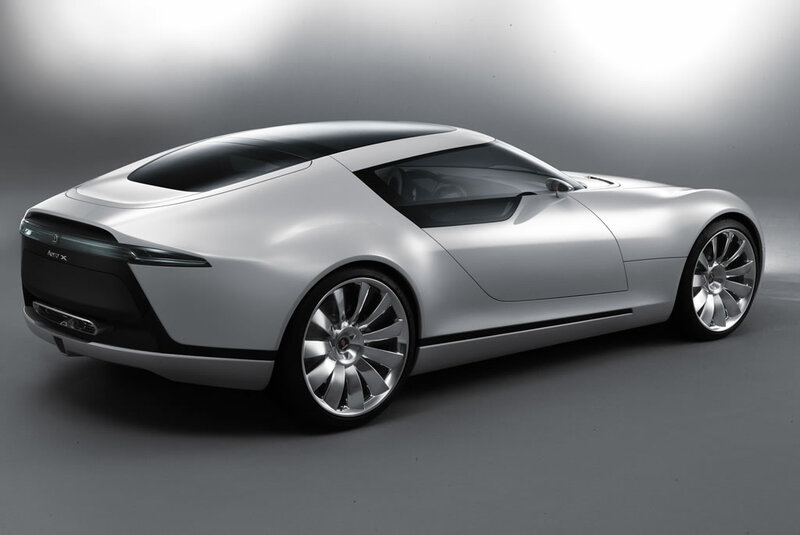 The Aero X presentation stretches variations already seen on the 9X concept and current 9-5 models even further. 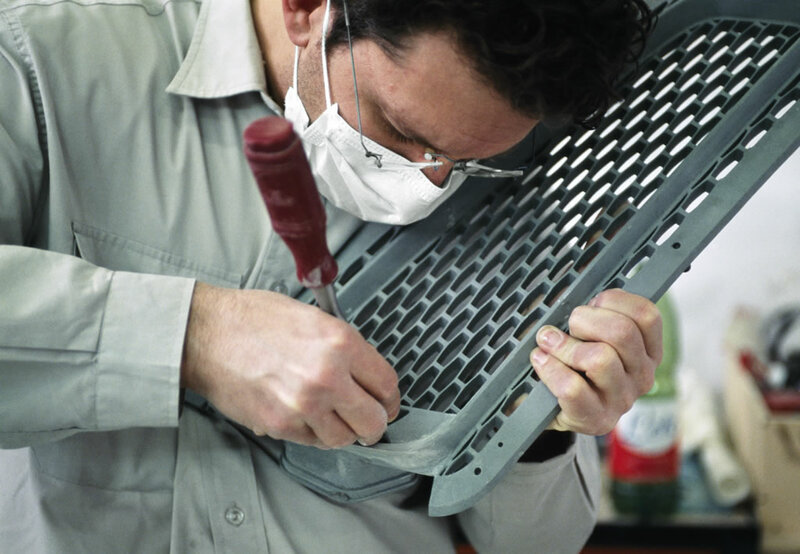 The main grille in brushed aluminum is now deeper, with a bolder horizontal central element, or bar, symbolizing the wings and fuselage of an aircraft. The headlamp units are mounted in the residual outer elements of the former three-port grille design. They feature as a development of LED technology by using extremely powerful, slightly larger bulbs, with just two required for main beam and one for dipped in each lamp unit. Echoing the optical effects to be found in the interior, they appear to contain deep precision-made, chamfered glass projector lenses. The bottom of each headlamp unit appears to run, or ‘melt’ like ice, towards the center of the nose. During daylight running, the units are also softly down-lit by small invisible LEDs in a green hue, the same color as used in the interior. The use of compact LED technology has allowed the design team to keep the front bodywork tight to the wheel-arches, reducing the length of the car’s front overhang. Moving rearwards down the long hood, the complete absence of any shut lines is immediately apparent. This is because the entire front section of the car, including the hood and front fenders, pivots up from the nose giving excellent access to the engine compartment and front suspension. 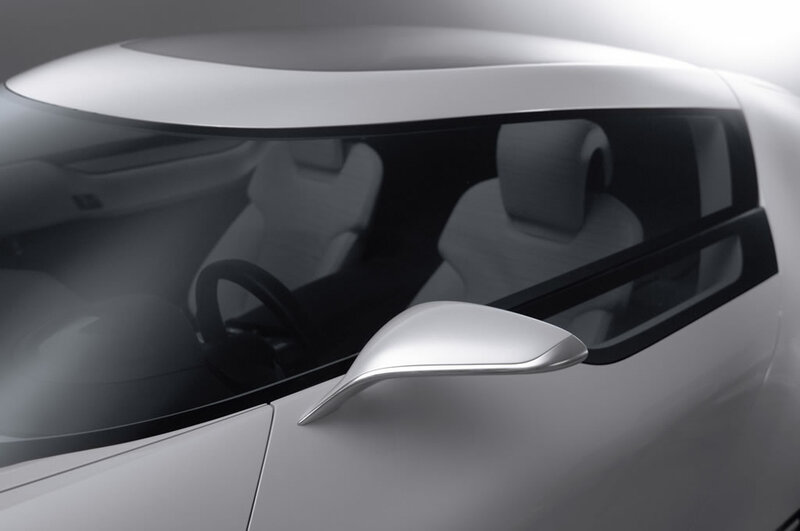 This feature, together with the elimination of doors and exterior handles, contributes to the clean flow of the bodywork, giving it a cohesive quality, further resembling the look of an aircraft fuselage. The design of the slender side mirrors – there are no doors – is probably the only concession to function not dictating form. They feature an aluminum-finished bottom section, a playful visual reference to the vestigial wings of an aircraft. In contrast, the form of the huge aluminum wheels is intended to help cool the brakes. 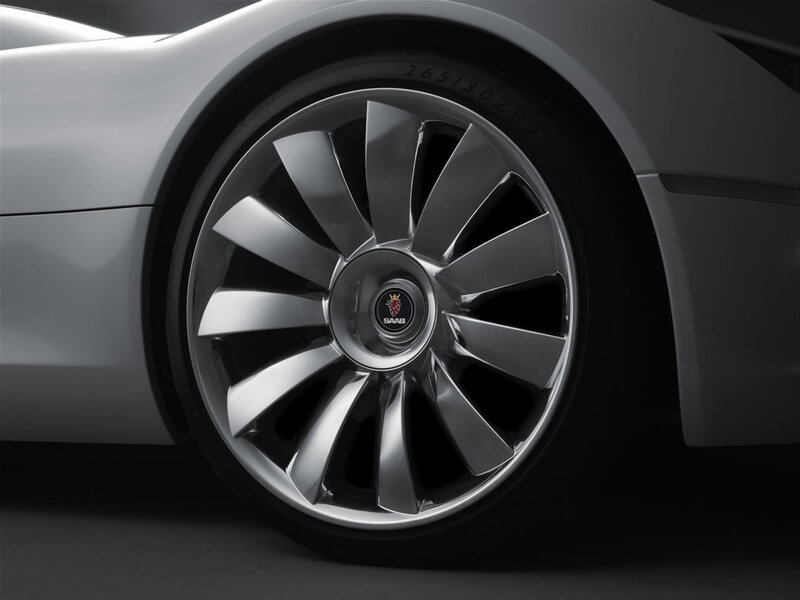 The 11 asymmetrically-shaped spokes are aligned to extract air from around the brakes when the car is in motion, while also visually referencing the blades of a turbofan jet engine. 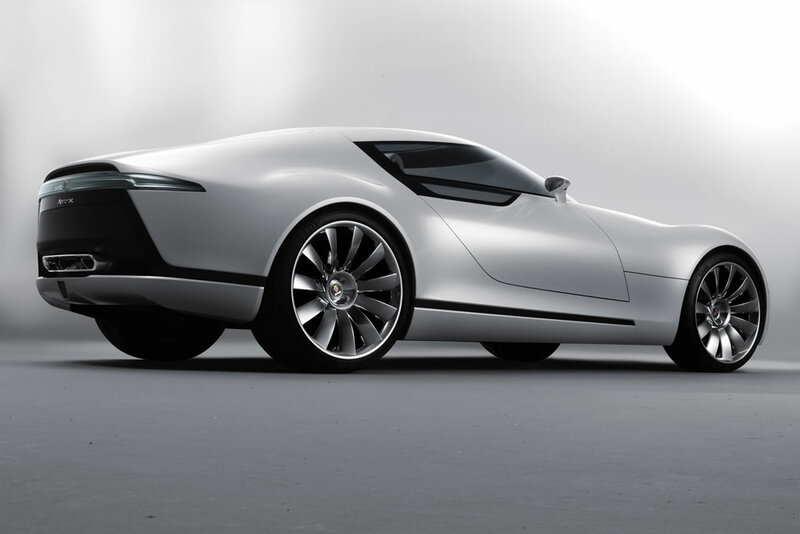 The pearlescent white bodywork sweeps up at rear, framing a deep, black ‘cut-out’ section in exposed carbon fiber, which culminates in an almost flat line below the rear window. Continuing the Aero X design metaphor, this ‘black zone’ is intended to represent the exhaust and afterburner chamber of a jet aircraft, within which the twin exhaust is located. The line of the zone is also a subtle visual reference to the cut-out shape of the rear lights in classic Saab 900 models. 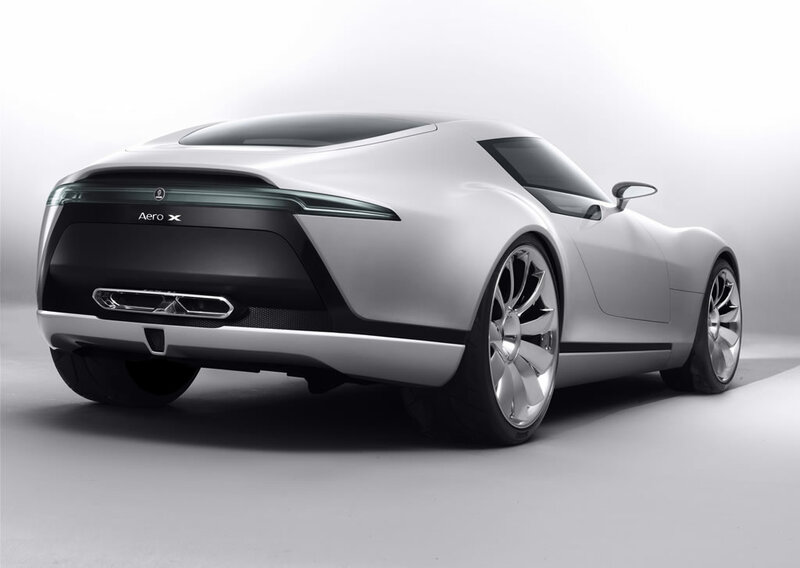 There are, in fact, no obvious tail-lights at all on the Aero X. This is because an opaque white bar, resembling the body color, runs across the back of the car at the top of the ‘black zone’. It accommodates LEDs for all rear light functions. When a light illuminates, it is diffused and softened, appearing to have a free form without a pinpoint light source. The short tail incorporates an opening rear hatch window and an element of surprising practicality, as you would expect to find in a car from Saab. The innovative twin stowage facility features a pullout, storage drawer – operated by remote control – under the cargo deck which is accessed separately through the opening rear window. The face of this drawer is effectively hidden within the ‘black zone’. The cockpit of the Saab Aero X reflects the aircraft metaphor of its exterior, blending Scandinavian design traditions with an uncompromising interpretation of how the interior of a high performance car from Saab should look. 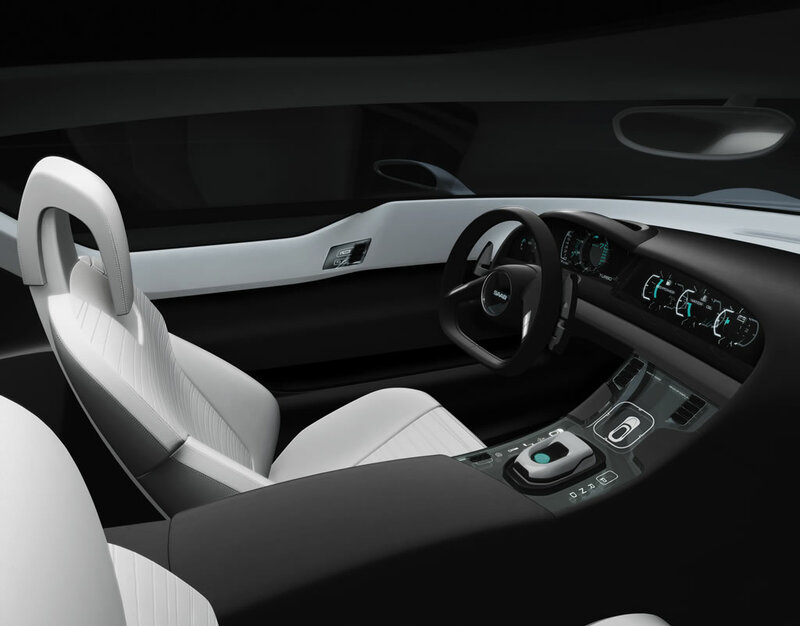 For the Saab Aero X, principle interior designer Erik Rokke has created a cabin like no other, taking the opportunity to extend the limits of design in new directions. They focused on producing a new expression of form and functionality. “As a concept, we are creating an interior for the fuselage of a jet aircraft, rather than the body of car,” explains Rokke. “You could almost say this is an interior without styling. We wanted to convey the beauty of functionality, balancing an element of rawness with decent comfort. In form, the interior features the elimination of windshield A-pillars and even doors. 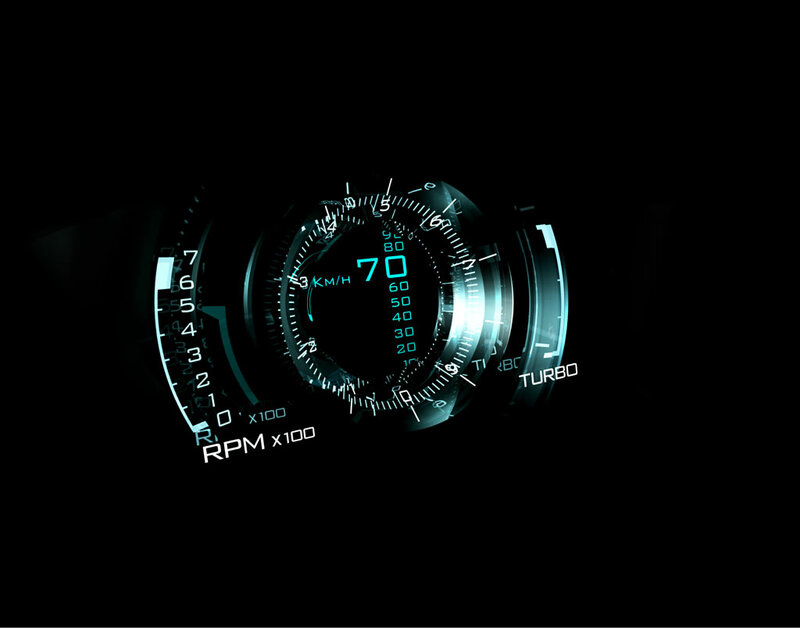 In functionality, it breaks away from having conventional panels of dials, buttons and information displays that commonly adorn the interior of a high performance car. There are no ‘cut-outs’ for recessed dials or any protruding buttons and switches. Instead, smooth, glass-like translucent surfaces cover the main driver display, front fascia and central console. 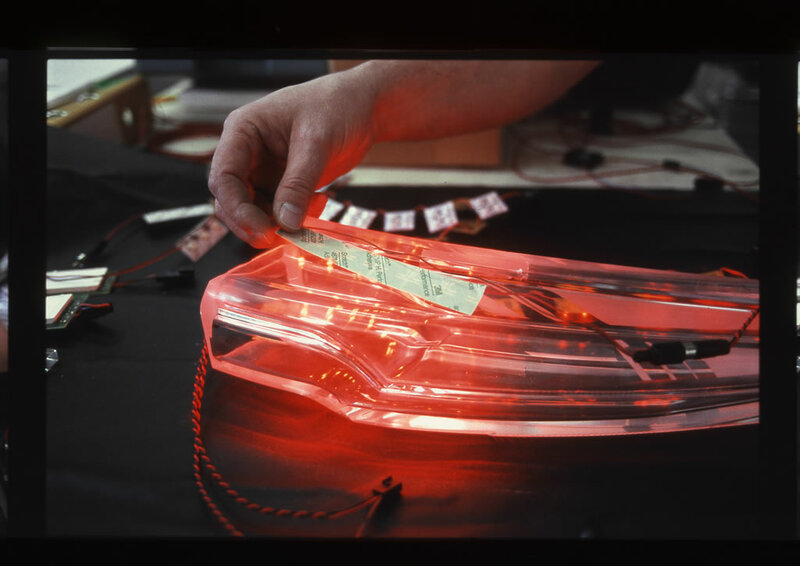 These ‘clear zones’ are used as screens through which information is projected in an innovative way with LED detailing, using surface treatment techniques derived from Scandinavian glass and precision instrument making. The overall effect is a most-modern expression of technical design. You would not, for example, find wood veneer, chrome trim or even carpeting inside the cockpit of a jet, and that’s why these conventional trim items are absent in such a performance-focused car as the Aero X. The view outside from the ‘pilot’s’ seat of the Aero X is also remarkably clear. The deep windshield sweeps round uninterrupted from B-pillar to B-pillar. And the view overhead, through the panoramic glass roof, is also unobstructed, just as you would expect to find seated at the controls of a jet. The screen has a water-repellent ‘hydrophobic’ coating, making windshield wipers unnecessary, and the canopy glass also absorbs UV rays. The light, airy ambience overcomes any claustrophobic feelings of being hemmed in, which may be experienced in conventional two-seater cabin. Below the Aero X’s canopy, all main interior surfaces are black. Apart from the acrylic ‘clear zone’ panels for the main driver display and center console, they are either left bare in carbon fiber or covered in leather, such as the top of the front fascia and the lower canopy sides. The only exceptions are the white leather seat squabs and backrests, complete with Saab Active Head Restraints (SAHR), which echo the exterior color. There is no attempt to disguise materials with fake finishes or to introduce unnecessary decoration and detailing. This strategy extends to the movement of the canopy. When open, its articulated linkages are fully exposed, and a section of the top of the fascia even lifts off to provide a better view of the mechanisms. The gas struts and pistons that control the canopy sides are also clearly visible during deployment. This celebration of functionality is clearly expressed by the aluminum handle for operating the canopy, mounted on the central console above the car’s deep transmission tunnel. It mimics the type of control lever you would see in an aircraft cockpit and its movement is choreographed to replicate a ‘mechanical’ action, rising and falling in unison with the deployment of the canopy. A simple one-touch button could have been adopted, but the team allowed themselves this design flourish in order to reinforce the interior’s functional character. The canopy lever is, in fact, part of a three-way ‘start’ function located between the seats as a very modern interpretation of Saab’s traditional, centrally-mounted ignition key. In its flat, ‘down’ position’, the lever doubles as a transmission selector, allowing the driver to access automatic drive or sequential gear changing via the steering wheel paddles. A green starter button nestles in the center of this lever/selector unit. Using a passive, keyless entry and exit system, the car is brought to life as soon as the driver thumbs this button. 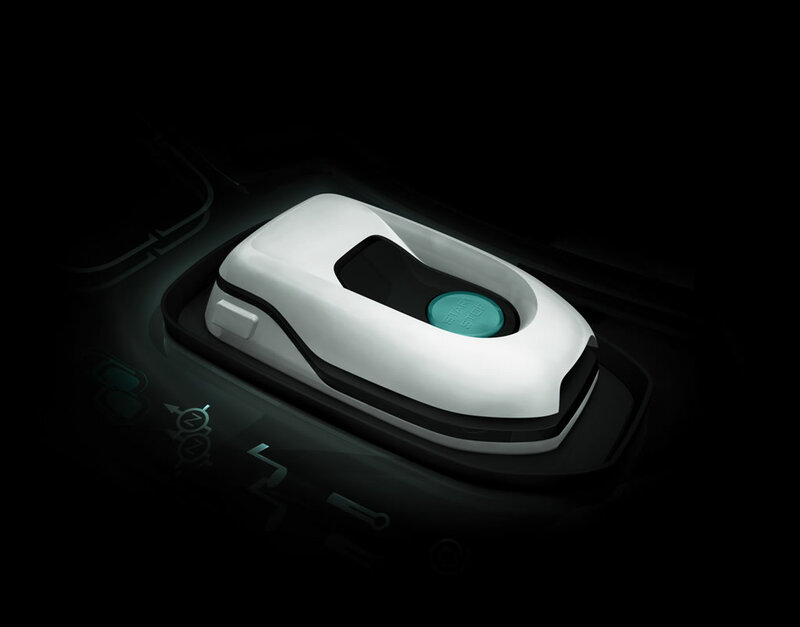 The previously hidden displays in front of the driver and in the central console are activated, the illuminated dials and icons appearing to ‘float in space’. They are pin-sharp in definition and have a layered, 3-D quality, resembling holograms. Their design is one of the highlights of the interior, inspired by aviation practice and techniques used in Scandinavian glass-making. Three stratified layers of acrylic make up the ‘clear zones’ of the front fascia and central console. Laser-etched images are embedded within these surfaces, which are each sandblasted and polished to varying degrees. When illuminated by LED from the back or side, the surfaces act like prisms so that different embedded images are picked out and projected as required. The main driver display consists of a striking 3-D analogue face, combining a central speedometer with turbo boost and tachometer indicators either side. Superimposed above this is a vertical scale showing speed in 10 kph increments. This beautiful image has an obvious aeronautical character, while communicating the visual appeal of a precision-made instrument. Subsidiary water temperature, oil pressure and fuel gauges are presented in a similar way in the center of the fascia. As this is a BioPower car, the fuel gauge also indicates the ratio of E100 and gasoline held in the tank. In the central console, displays for infotainment, satellite navigation and air conditioning are selected by two toggle buttons alongside the canopy lever. The driver then chooses options and settings via eight flush-mounted buttons in the center of the main fascia, each identified by a different icon according to the mode selected. Again, these images appear to be suspended in space, as if trapped inside a sheet of glass. The slim, leather-trimmed steering wheel carries gear selector paddles and remote control buttons on its two spokes. The center boss is backlit by LED to illuminate the Saab logo. To underline the car’s performance focus, all driving control surfaces, apart from the black steering wheel, are highlighted in a brushed aluminum finish. These include the steering wheel paddles, indicator stalks, the cockpit canopy lever and the accelerator and brake pedals, which also have black, anti-slip inserts. 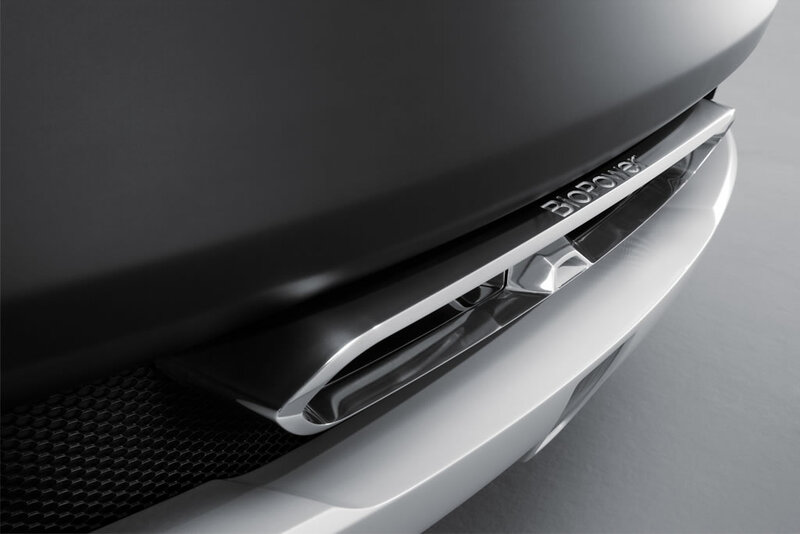 A final design flourish is to be found at the rear of the Saab Aero X, giving it an element of surprising practicality, as you would expect from a Saab car. Concealed under the opening rear hatch window is a twin stowage facility. Beneath the main cargo floor is an extending drawer, operated by remote control, which on the show car provides stowage for Soul Flyer* gear from Salomon, the leading supplier of freedom action sports equipment. It could also be used to separate potentially mucky outdoor gear from the rest of the luggage. On the ground and in the air, the Aero X promises exceptional levels of performance. The BioPower V6 twin-turbo engine not only delivers impressive power, it also offers the prospect of zero fossil CO2 emissions. 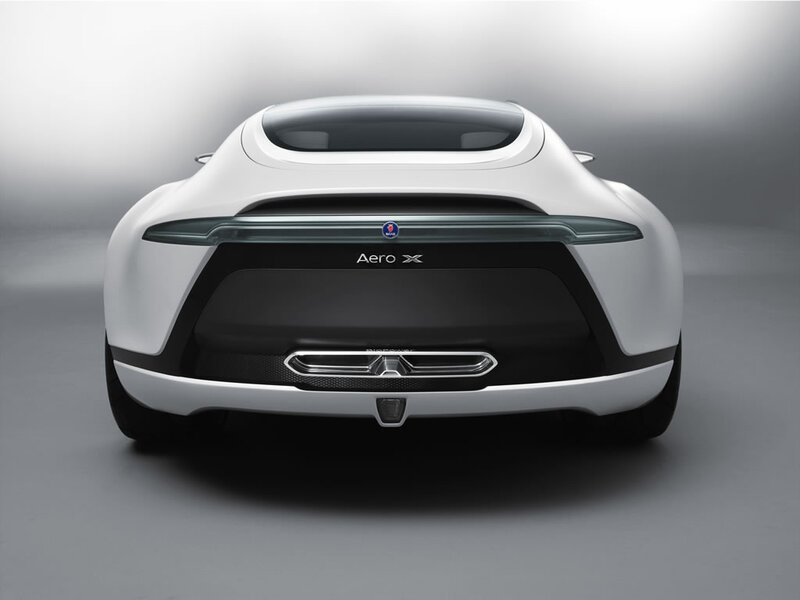 The Aero X concept showcases the potential of Saab BioPower to offer drivers ‘green performance’: increased engine power with a greater regard for the environment. Running on 100% bioethanol, a renewable and sustainable fuel, its advanced 2.8V6 BioPower engine delivers 400 bhp maximum power at 5,000 rpm and massive torque of 500 Nm between 2,000 and 5,000 rpm. Computer simulations anticipate zero to 100 kph acceleration in just 4.9 seconds and a 250 kph (limited) top speed. For optimum handling, the powertrain is mounted entirely behind the front axle line, giving the Aero X a near perfect 50/50 weight distribution. All-wheel-drive, with a variable torque split between the front and rear axles, provides superb traction and Saab Active Chassis, with continuously variable damping, gives excellent real-life driving safety and control. By combining bioethanol with turbocharging, Saab BioPower exploits the high octane performance of this fuel, as well as its environmental benefits. The technology is already well-proven by the outstanding sales success of the Saab 9-5 2.0t BioPower in Sweden and its introduction on other markets. 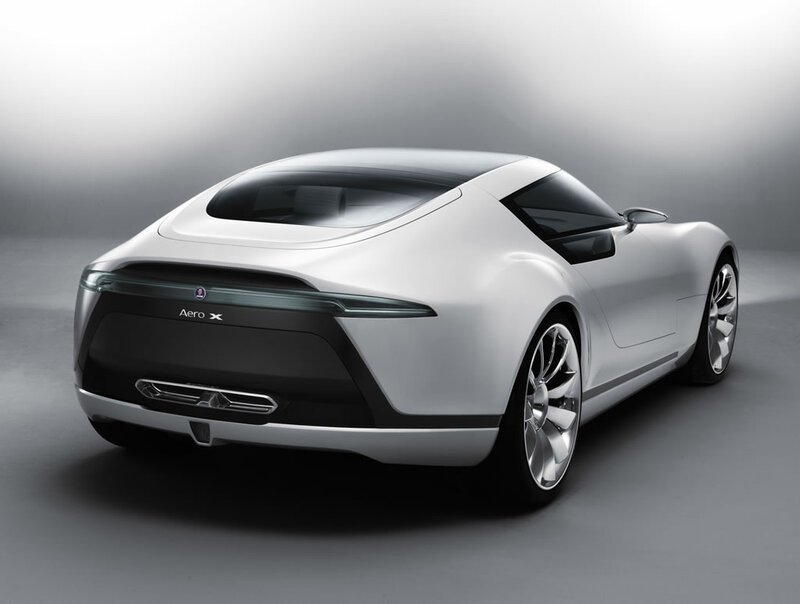 For the Aero X, Saab takes BioPower to a new level by using pure bioethanol (E100) fuel, with a higher octane rating of 106 RON compared to gasoline’s 95 RON. Using a 12:1 compression ratio and twin turbochargers running at 1.0 bar boost, this high-feature engine delivers an impressive 143 bhp/ per liter. Turbocharging with E100 fuel allows the use of a higher compression ratio – giving more engine power – than is possible with gasoline because of the risk of harmful ‘knocking’ or pre-detonation. The all-aluminum, 24-valve, four-cam engine is a high performance development of the current version in the Saab 9-3 range. For the Aero X, it is longitudinally installed and features a Spark Ignited Direct Injection system (SIDI) for optimum combustion; variable inlet and exhaust cam phasing for improved breathing, and dry-sump lubrication for a lower chassis installation and reduced oil pumping losses. Both turbochargers have variable geometry turbine (VGT) wheels to give a quick low-end response. More durable valves and valve seats are fitted, together with bioethanol-compatible materials in the fuel system, including the tank, pump, lines and connectors. The addition of the SIDI system ensures the same cold starting performance as a normal gasoline engine. The 32-bit engine management system simultaneously controls the ignition timing, fuel injection, turbo boost pressure, air mass measurement and the throttle setting. For minimized exhaust emissions, the two close-coupled catalysts are equipped with electronically controlled, secondary air injection, which gives extremely quick ‘light-off’ following cold starts. By using 100% bioethanol, the Aero X driver can enjoy ‘supercar’ levels of performance – without raising atmospheric levels of CO2, the ‘greenhouse’ gas that is regarded as a major contributor to global warming. Bioethanol fuel is produced commercially from agricultural crops or forest residues. Unlike gasoline, its consumption does not add more CO2 to the atmosphere because emissions during driving are balanced by the amount of CO2 that is removed from the atmosphere when crops for conversion are grown. In this way, the CO2 already present in the atmosphere is simply recycled, whereas the use of a fossil fuel, such as gasoline or diesel, releases new amounts of CO2 which have been locked away underground. “Turbocharging and bioethanol make excellent partners,” says Kjell ac Bergström, Executive Director of Saab Automobile Powertrain AB. “In developing this BioPower V6 engine we have been able to take the next step by using E100 fuel, pure 100% bioethanol. That means there are zero fossil CO2 emissions because we are not using any gasoline at all. The sophisticated, seven-speed automated manual transmission uses a wet double clutch system to allow fast, full throttle, sequential gear changes via the steering wheel paddles. Power is transmitted to all four wheels through a multi-plate clutch, allowing an infinitely variable front/rear torque split. Suspension is by double wishbones at the front and an independent multi-link layout at the rear. Continuously adjustable damping (Saab Active Chassis) is adopted for enhanced body control, ride comfort and driving safety. Saab Active Chassis involves processing signals from a number of on-board sensors which measure the vehicle’s vertical, lateral and body-in-roll movements. These inputs are fed into a central control unit, which monitors the behavior of each wheel as often as 100 times per second. It can then calculate and make small adjustments to the valving of each relevant damper as required in just 10-30 milliseconds. 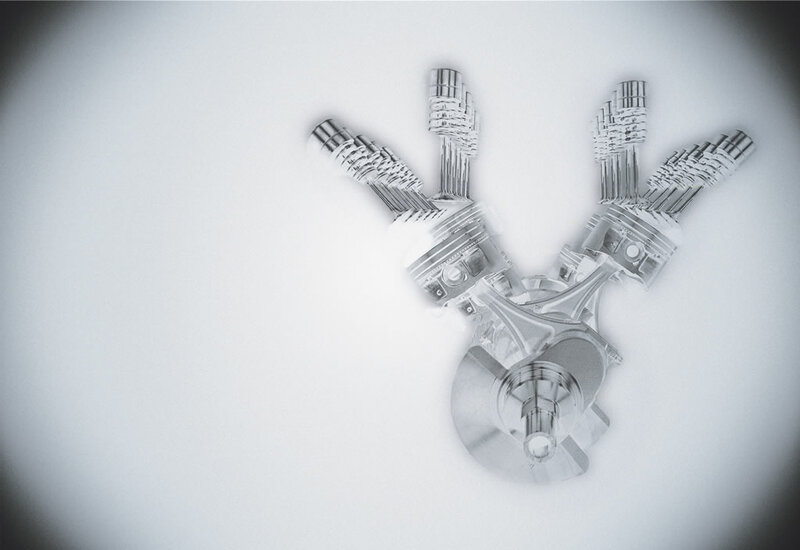 Opening the valve increases oil flow to allow softer damping, while closing the valve produces firmer damping. A range of pre-settings can be selected by the driver. The Aero X has stopping power to match its performance. Large brake discs (380 x 34 mm, internally ventilated front and rear) clasped by eight-piston, monobloc aluminum calipers ensure rapid and virtually fade-free retardation. The Saab Aero X is a radical demonstration of the power of the Saab brand to inspire design themes and features th could appear in the Saab cars of tomorrow. 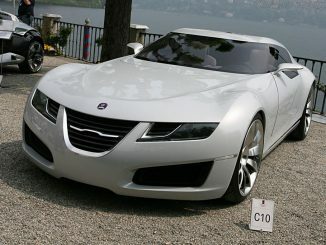 It is the latest in a series of concepts from Saab. The Aero X was created as a graphic answer to a simple question: What would happen if an entire car was dedicated to expressing Saab’s heritage in a new way? The question was posed just over a year ago by Bryan Nesbitt, Executive Director of Design for GME. 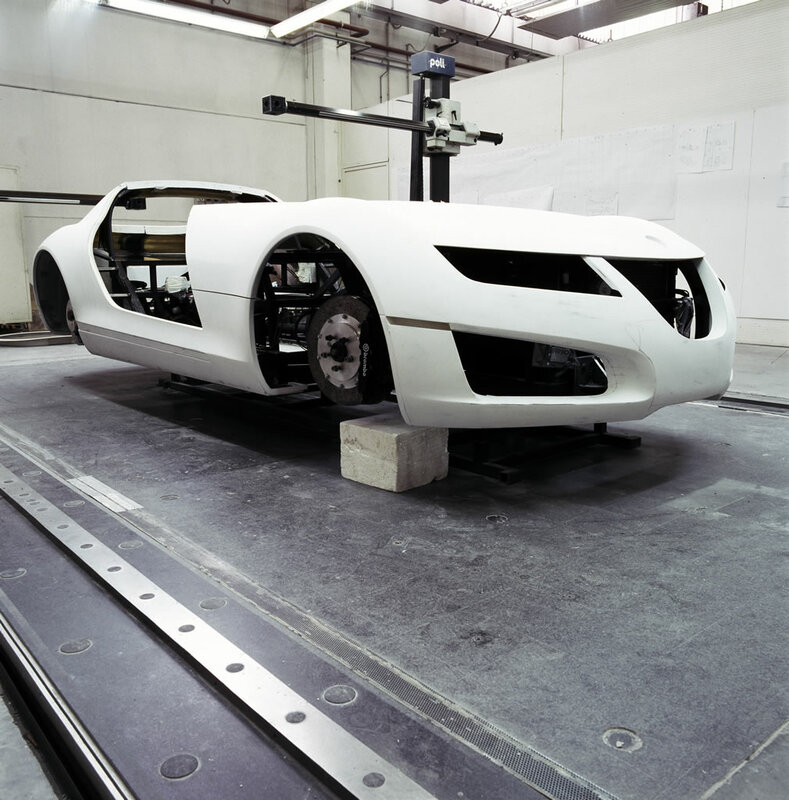 He wanted to explore the potential for developing a bolder, more distinctive design language for Saab products. 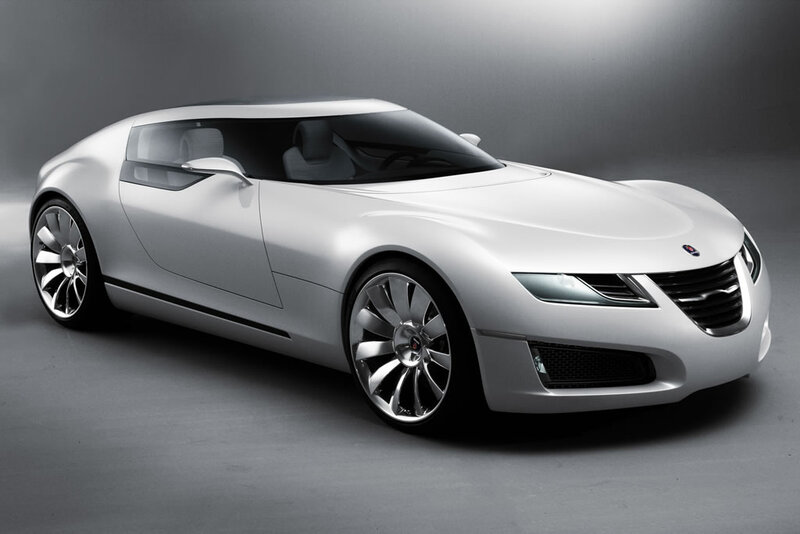 Saab designers in Sweden drew up a number of outline proposals. 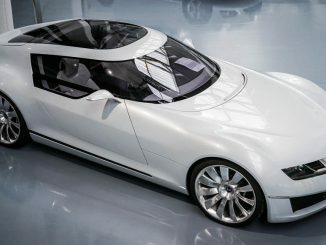 An exciting sports concept that would bring Saab’s aviation and Scandinavian roots into sharper focus was quickly chosen. The Aero X shows how deep roots can inspire new design directions that remain faithful to the brand’s core values. It is the latest step in a series of concepts that have each highlighted different facets of the brand. The Saab 9X, exhibited at the IAA Frankfurt Show in 2001, demonstrated the multi-dynamic, versatile qualities of the Saab brand. Its innovative, ‘four dimensional’ format incorporated features typical of a coupe, roadster, wagon and even a pick-up. It was followed at the 2002 Detroit Show by the 9-3X ‘cross-over coupe’ concept, which combined four-wheel-drive, off-road capabilities with a sporty, three-door body format. At the 2003 Frankfurt show, Saab then revealed the 9-3 Sport-Hatch concept, previewing its move last year into the medium-size, premium wagon segment with the 9-3 SportCombi. Now, with the Aero X, Saab has turned the dial marked ‘performance’ right up for the first time. And it does so in a way only Saab can – by leveraging the potential of a turbocharged BioPower engine and its own aviation heritage. By using BioPower, the Saab Aero X gives an environmental dimension to the phrase ‘performance with responsibility’ and expresses a strong Scandinavian tradition of respect for the environment. 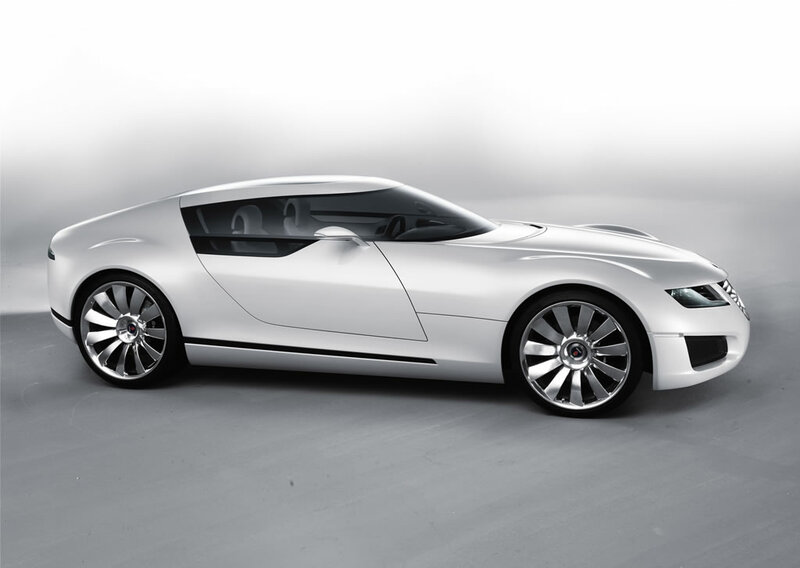 And it would not be a Saab without using turbocharging to maximize the performance potential of bio-ethanol fuel. In looks, the Aero X is focused outside and inside on echoing the performance-driven character of a jet aircraft. 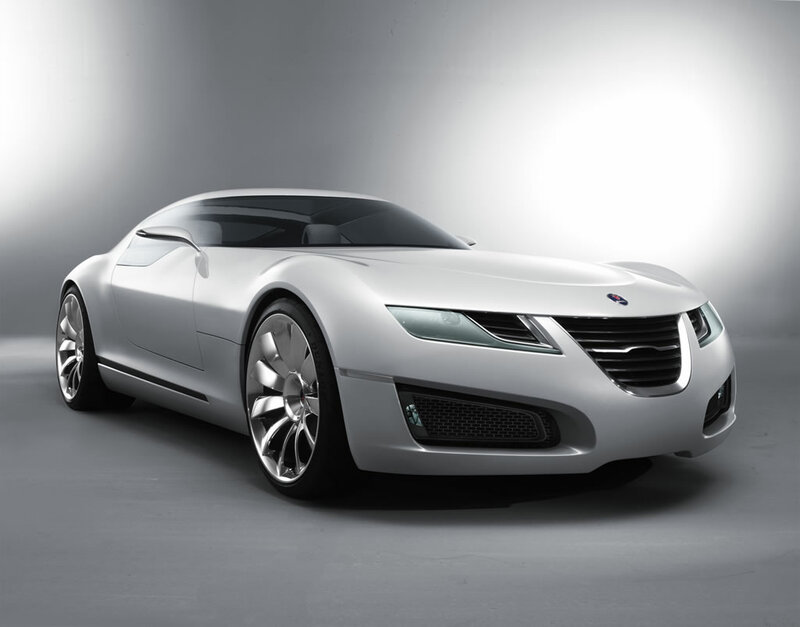 In being devoted to expressing this theme, it is the most visually committed design to be shown by Saab. “The Aero X is an extreme brand statement,” says Knut Simonsson, Saab’s Executive Director of Global Brand and Sales Operations. 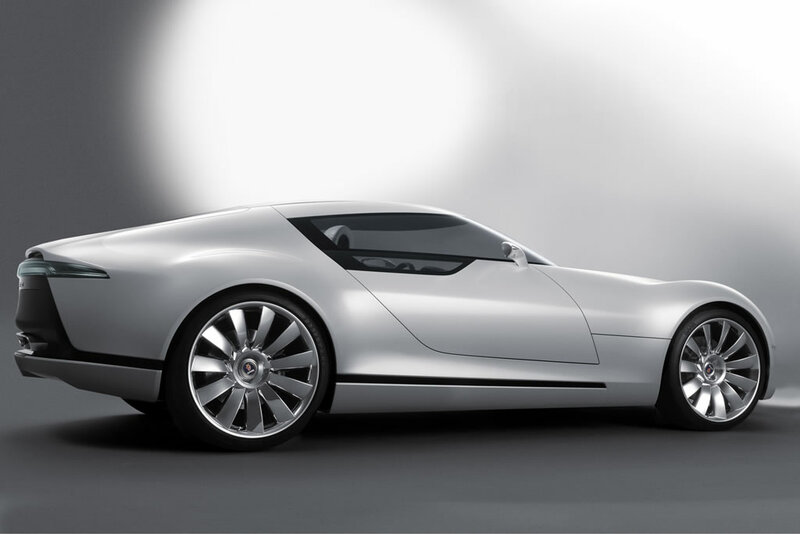 “It puts a clear emphasis on using Saab’s aviation heritage to express sporty design. “All our concept cars share the core values of the brand: progressive design, sporty driving and surprising functionality. These are the results of Saab’s heritage, its story, which is about roots in aviation, Scandinavian culture and innovative thinking. “The Aero X clearly emphasizes sportiness more than previous concepts, but it does so in a Saabish way, drawing on the potential of the brand’s story. However, even in such a focused car as this, there is an element of surprising functionality with the twin storage facility. Saab BioPower 2.8-litre V6 turbo. 24-valve, four OHC. All aluminium construction. E100 fuel. 12:1 compression ratio. VVT, exhaust and inlet. SIDI (Spark Ignited Direct Injection). Seven-speed, automated manual transmission with double clutch system. Sequential gear changes via the steering wheel paddles. All-wheel-drive through multi-plate clutch, variable front/rear torque split. Front: Double wishbones, coil springs, elec.adj. dampers, anti-roll bar. Rear: Multi-link, coil springs, elec. adj. dampers, anti-roll bar. Saab Active Chassis: continuously adjustable damping control. Rack and pinion, hydraulic power-assisted. ABS, MBA, EBD, electronic stability control.